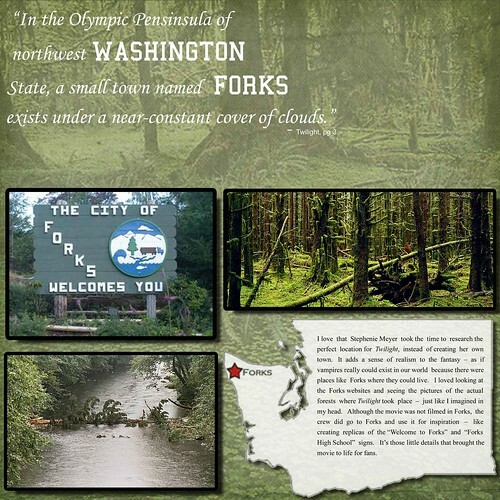 What Twilight scrapbook would be complete without a page dedicated to Forks? I may expand the Forks coverage to more pages - the photos are just so beautiful. This is a digital layout created in PSE 5.0. The photos are from Stephenie Meyer's website and a few Forks websites (links to them from Stephenie Meyer's website). I can't wait - I'm going to Forks!! Follow loveEC12 on Twitter to hear about my trip, and check out http://scrapbookingtales.mybisi.com as I add the the pages I'm using to scrapbook the trip!